Join 150+ geoprofessional executive level industry leaders forGBA’s 2019 Fall Conference convening October 3-5, 2019 at the Omni Louisville Hotel in Louisville, Kentucky. This two-and-a-half-day conference will offer premier programming on key topics as well as networking and social events allowing attendees the opportunity to build lasting personal and professional relationships with major industry stakeholders. Details available late June 2019! GBA will award Professional Development Hours (PDHs). Details available in late June 2019! On-line Reservation Link: Available in April 2019! The Omni Louisville Hotel with 612 elegantly appointed guest rooms is the new cornerstone of downtown. The hotel boasts several unique dining experiences including: Bob’s Steak & Chop House open nightly for dinner and located off the lobby offers award-winning prime steaks and wines in a classic setting with interior celebrating the history and tradition of American thoroughbred racing; Pin + Proof (speakeasy) offers cocktails and a light menu as well as four professional bowling lanes where you can get your game on with colleagues; the Water Company rooftop pool and bar (open seasonally) offers the perfect place to relax and socialize around fire pits as you share a cocktail while enjoying views of the downtown skyline; and the Library Bar is the perfect place to indulge in Louisville’s bourbon culture with locally inspired cocktails. The hotel’s convenient location allows guests to easily make their way to Main Street and indulge in Louisville’s bourbon culture at the many popular distilleries or to visit the Louisville Slugger Museum & Factory or Churchill Downs race track. The hotel is also less than 10 miles from the Louisville International Airport. All reservations must be guaranteed by a valid major credit card, which must be supplied at the time the reservation is made. Regardless of how the reservation is made, any guaranteed reservation not cancelled 72-hours prior to arrival will be subject to one night’s room and tax cancellation fee. In addition, attendee that fails to arrive on the scheduled arrival date will be considered a “No Show” and a charge of one night’s room and tax will be posted to the individual attendee’s credit card on file. Upon check-in, each guest will be required to present a valid credit card, on which an amount of sufficient pre-authorization can be obtained to cover the room, tax charges and possible miscellaneous charges. Mention the Geoprofessional Business Association or GBA and the GBA’s 2019 Fall Conference to be quoted the group rates. An on-line link for room reservations will be available in late April 2019. Secure room reservation early: GBA’s cut-off date is Friday, September 6, 2019…. Once GBA’s room block is filled the hotel and GBA cannot guarantee availability of guest rooms at the GBA group rate. Pre/Post Room Nights: Limited guest rooms may be available for up to 3 days pre/post the official conference dates of October 3-5, 2019 at the hotel based on availability at the time reservations are made and at the hotel’s discretion. If you plan to extend your stay prior to or post the official conference dates, please contact the hotel as soon as possible for best availability. Hotel Reservation Changes and Cancellations: The Omni Louisville Hotel has a 72-hour room reservation cancellation policy. Room reservation cancellations received less than 72-hours prior to arrival will be subject to one night’s room/tax cancellation. Please Note: In-order-to minimize any charges to you, your firm, or to GBA, if you need to cancel your room reservation, please do so in a timely manner directly with the Omni Louisville Hotel so that the guest room nights can be re-sold to other GBA guests. If you have questions, contact GBA staff – Barb ([email protected]) or Sara ([email protected]) even if you have to cancel late so that GBA can try to assign your guest room to someone else. Check-in / Check-out Times: Check-in time is 3:00 PM; check-out time is 11:00 AM. If you plan to arrive earlier than 3:00PM, call the hotel directly on your arrival day and ask the front desk attendant if there are any rooms available allowing you to check-in early. The Geoprofessional Business Association and the Omni Louisville Hotel cannot guarantee check-in before 3:00 PM. Requests for late check-out on your departure day may be limited and is at the discretion of the Hotel. Early Departure Fee/Policy: The Omni Louisville Hotel has an Early Departure Fee/Policy; i.e., if you reserve to depart on the 4th, but leave a day early, you will be charged for the night you “missed” at the group room rate plus tax, unless you make arrangements with the hotel’s front desk manager in advance. Emergency and other special circumstance situations will be reviewed by the hotel on a case by case basis. Louisville – A charming city nestled on the banks of the Ohio River offers 120 attractions. Louisville is home to many one-of-a-kind original attractions, events, and places including the Louisville Slugger Museum and Factory, internationally known Muhammad Ali Center and Churchill Downs – home to the Kentucky Derby. The birthplace of the cheeseburger, the Mint Julep, Derby Pie and more Victorian-style homes in one area than any other city in America…Louisville’s originality is obvious in many ways. Connoisseurs visit Bourbon Country and food aficionados come for the diverse dining as the city rates as one of Bon Appetit’s “top 5 foodiest small towns” and Southern Living’s Top 10 Tastiest Towns. The city’s history, art, and architecture constitute itineraries all their own. Louisville combines serious business with serious southern hospitality. Louisville’s Culinary Scene – Louisville’s growing food reputation is putting the city on the culinary map. And it’s not just the city’s eclectic, innovative and award-winning restaurant scene, but also locally made products that are setting the city apart (with and beyond the Bourbon!). The accolades continue to grow from the World Food Travel Association’s grand prize award for “Best Destination Experience” to Southern Living magazine’s “top 10 tastiest towns in the South,” to Zagat naming Louisville “one of the top eight ‘awesome foodie getaways in the world’” – the only US destination. Travel + Leisure named Louisville one of the “Best Places to Travel” and Fodor’s put Louisville on their “Go List” for 2015, largely based on culinary reasons. 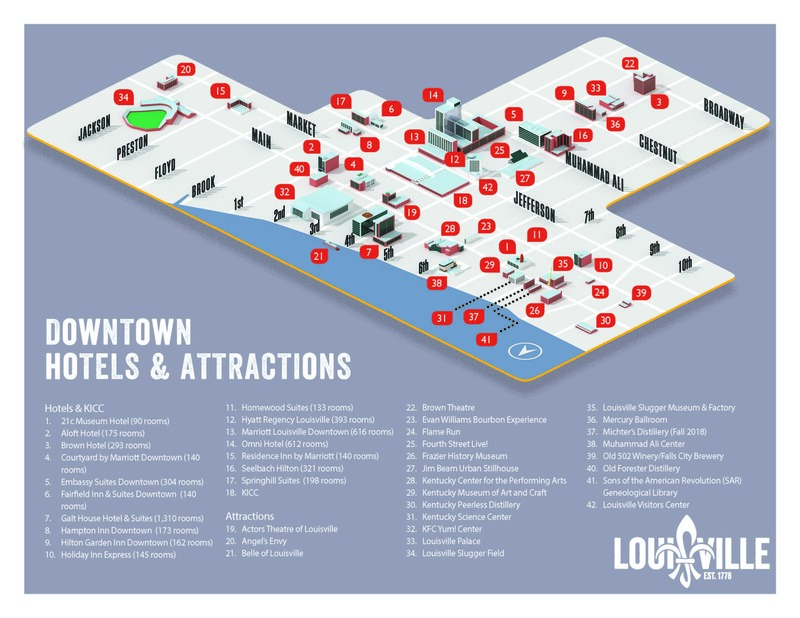 Highlights include: the hot dining corridors of Bardstown Road, Frankfort Avenue, NuLu and Whiskey Row; the approximately 50 independent restaurateurs that unite as the Louisville Originals; Louisville’s emerging craft beer scene – termed Lou’s Brews; and of course the bourbon culture that permeates in the state that produces 95% of the world’s bourbon supply. Louisville is the Culinary Capital of Bourbon Country. Click on any of the links below to view various maps of Louisville, Kentucky, local attractions and area neighborhood. A refund (less $125/per person administrative fee) will be given to individuals whose cancellations are received by 5:00PM Eastern Time, Friday, September 6, 2019. For cancellations received after that date, but not later than 5:00PM Eastern Time, Friday, September 20, 2019, the cancellation fee will be $250/per person, for administration, food service and related guarantee charges that GBA will have to absorb. No refund or credit may be given after 5:00PM on Friday, September 20, 2019. Please note: GBA may charge an individual whatever GBA has to pay the hotel (in attrition fees) if you fail to cancel a room reservation in a timely manner and GBA is unable to assign the room to someone else. Be sure to notify Barb ([email protected]) or Sara ([email protected]) even if you have to cancel late so that GBA can at least try to mitigate any additional charges.